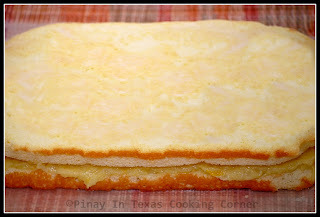 Inipit which literally means "pressed" is a sandwich like pastry which originated in Malolos, Bulacan where I was born. 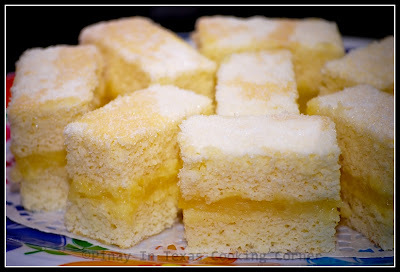 Inipit which is basically two slices of sponge cake with custard filling is an established food product unique to Bulacan. 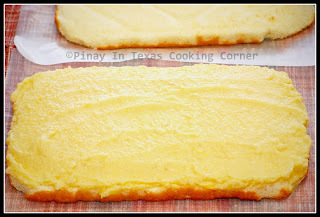 It's called inipit because the custard filling is "pressed" or inipit by two slices of sponge cake. It was introduced to the public by the late Salome P. De Ramos of Malolos, Bulacan during the 1940’s. Today I'm sharing with you my mom's recipe which I altered a little. I was missing inipit so bad that I tried making it myself yesterday. It came out good and I know I'll be making it often from now on! * I'm also sharing this on What's Cooking Wednesday, What's on the Menu Wednesday, Real Food Wednesday, Miz Helen's Country Cottage's Full Plate Thursday and It's a Keeper Thursday. 4.4 Slice into 1"x2" rectangles, or as desired. Just like Clabber Girl which is a favorite among chefs..Inipit is truly a favorite among Bulakeños! 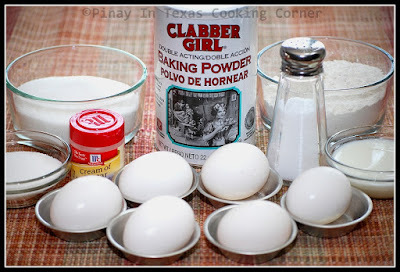 Give it a try using Clabber Girl Baking Powder --- you won't regret it! I can see why you like it, it sounds wonderfully refreshing and light! goodness, love the filling inside and then the outcome of it, stop making me hungry please. these looks devine. 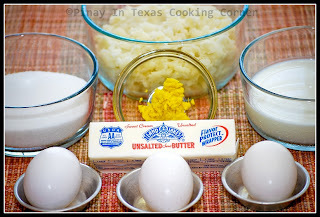 thanks so much for linking up to the Iron Chef Challenge and we will definitely try to get you another cook book. I really enjoyed your post. 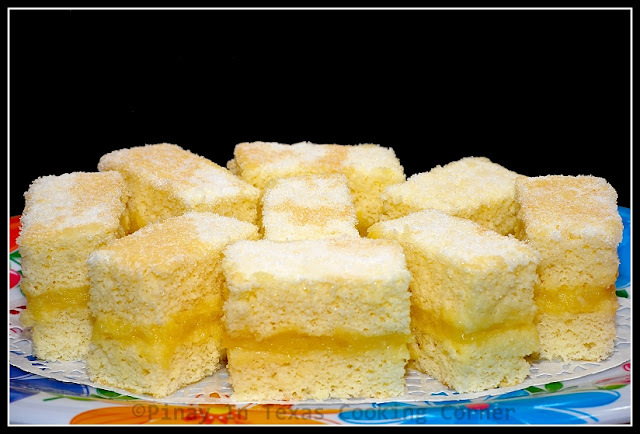 The Inipit is a great cake with wonderful filling. It looks delicious. Thank you so much for sharing with Full Plate Thursday and hope to see you next week. Have a wonderful week end! What a wonderful summertime recipe. It seems so light and refreshing. 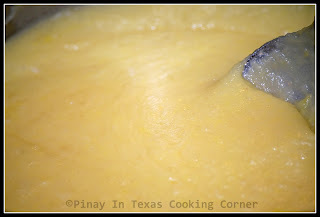 I love lemon curd filling. Great recipe and congrats on winning the Iron Chef Challenge! What kind of potato will i use? Nice to have you here! Hope you'll share PiTCC with your friends. Where in Bulacan are you? I was born in Malolos. the first time i tried it was when i spent a nite with my high school friend in Malolos Bulacan, her mom came home with inipit(which i thought the name then was pianono) IT TASTED HEAVENLY!!! thank you for sharing the recipe. I surely would like to make these Inipits. Glad to have you here! Let me know how it turns out when you try the recipe! I've been craving Eurobake's Inipit for a long time and thought to google and voila! found your link. Can I use Red Ribbon's sponge cake instead of making it from scratch? Sorry, I like shortcuts only because I don't have the luxury of time. I can make the filling easily. Thanks! i tried this and it was delicious but why is it wet? I tried this recipe the other day and It turned out great and delicious. Can I use cake flour instead of all purpose flour? My kids wanted a little more softer sponge cake. I am gonna try this soon.